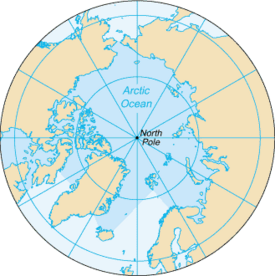 An Azimuthal projection showing the Arctic Ocean and the North Pole. The North Pole is defined as one of the two points where the Earth's axis of rotation meets the Earth's surface (the other being the South Pole, diametrically opposite). The North Pole is the northernmost point on Earth; it defines latitude 90° North, as well as the direction of True North. At the North Pole all directions point south. While the South Pole lies on a continental land mass, the North Pole is located in the middle of the Arctic Ocean. There is no land at the North Pole, just waters that are almost permanently covered with constantly shifting sea ice. This makes it impossible to construct a permanent station at the North Pole (unlike the South Pole). The sea depth at the North Pole has been measured at 13,410 ft.Sunrise and sunset do not occur in a twenty-four hour cycle at the North Pole; sunrise lasts for three months until the sun reaches its highest point at the summer solstice. The Earth's Geographic North Pole is also referred to as the Terrestrial North Pole, but usually simply called the North Pole. The Earth's axis of rotation—and hence the position of the North Pole—was commonly believed to be fixed until the eighteenth century when the mathematician Leonhard Euler predicted that the axis might "wobble" slightly. Around the beginning of the twentieth century astronomers noticed a small apparent "variation of latitude," as determined for a fixed point on Earth from the observation of stars. Part of this variation could be attributed to a wandering of the Pole, by a range of a few meters. The wandering has several periodic components and an irregular component. The component with a period of about 435 days is identified with the eight-month wandering predicted by Euler and is now called the Chandler wobble after its discoverer. This "wobble" means that a definition of the Pole based on the axis of rotation is not useful when meter-scale precision is required. It is desirable to tie the system of Earth coordinates (latitude, longitude, and elevations or orography) to fixed landforms. Due tocontinental drift and the rising and falling of land due to volcanoes, erosion and so on, there is no system in which all geographic features are fixed. The International Earth Rotation and Reference Systems Service and the International Astronomical Union have defined a framework called the International Terrestrial Reference System that defines the North Pole as the geographic North for precision work; it does not quite coincide with the rotation axis. One of the earliest expeditions to set out with the explicit intention of reaching the North Pole was that of British naval officer William Edward Parry, who in 1827 reached latitude 82° 45' North. The Polaris expedition, an 1871 American attempt on the Pole led by Charles Francis Hall, ended in disaster. In April 1895 Norwegian Fridtjof Nansen reached latitude 86° 14´ North. The American explorer Frederick Albert Cook stated that he reached the North Pole in 1908, but his claim is not widely accepted. The conquest of the North Pole is traditionally credited to American Navy engineer Robert Edwin Peary, who claimed to have reached the Pole on April 6, 1909, accompanied by American Matthew Henson and four Inuit men named Ootah, Seeglo, Egigingwah, and Ooqueah. However, Peary's claim remains controversial. The party that accompanied Peary on the final stage of the journey included no one who was trained in navigation or anyone could independently confirm his own navigational work, which some claim to have been particularly sloppy as he approached the Pole. "The admiration and respect which I hold for Robert Peary, Matthew Henson and the four Inuit men who ventured North in 1909, has grown enormously since we set out from Cape Columbia. Having now seen for myself how he traveled across the pack ice, I am more convinced than ever that Peary did indeed discover the North Pole." The first undisputed sighting of the Pole was on May 12, 1926 by Norwegian explorer Roald Amundsen and his American sponsor Lincoln Ellsworth from the airship Norge. Norge, though Norwegian owned, was designed and piloted by the Italian Umberto Nobile. The flight started from Svalbard and crossed the icecap to Alaska. Nobile, along with several scientists and crew from the Norge, overflew the Pole a second time on May 24, 1928 in the airship Italia. Discounting Peary's disputed claim, the first men to set foot at the North Pole were, according to some sources, a Soviet Union party, including Pavel Gordiyenko and five others, who landed a plane there on April 23, 1948. On May 3, 1952 U.S. Air Force Lieutenant Colonel Joseph O. Fletcher and Lieutenant William P. Benedict also landed a plane at the North Pole. Flying with them was scientist Albert P. Crary. The United States Navy submarine USS Nautilus (SSN-571) crossed the North Pole on August 3, 1958, and on March 17, 1959, the USS Skate (SSN-578) surfaced at the pole, becoming the first naval vessel to reach it. Sir Wally Herbert led the team that made the first surface crossing of the Arctic Ocean (1968-1969)—and by its longest axis—a feat that has never been repeated. In so doing the team became the first to reach the North Pole by surface travel without the assistance of airlifts. No one alive today has personally surveyed and mapped on the ground a larger area of Antarctica than Sir Herbert. He has been awarded the Polar Medal and was knighted in 2000 for services to polar exploration. The Soviet nuclear powered icebreaker Arktika completed the first surface vessel journey to the North Pole on August 17, 1977. In 2005, the United States Navy submarine USS Charlotte (SSN-766) surfaced through 61 inches (155 cm) of ice at the North Pole and spent 18 hours there. In the summer of 2007, as part of the research related to 2001 Russian territorial claim, Russia is going to perform the scientific exploration of the Arctic using manned submersion onto the ocean bottom at the point of the Geographic North Pole, to a depth of 3.11 miles (5 km). 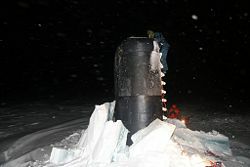 MIR submersible is planned to be used for this purpose, and the crew should include a well-known Soviet and Russian polar explorer Arthur Chilingarov. During the summer months, the North Pole experiences twenty-four hours of daylight daily. During the winter months, the North Pole experiences twenty-four hours of darkness daily. Sunrise and sunset do not occur in a twenty-four hour cycle. At the North Pole, sunrise begins at the Vernal equinox taking three months for the sun to reach its highest point at the summer solstice when sunset begins, taking three months to reach sunset at the Autumnal equinox. A similar effect can be observed at the South Pole, with a six-month difference. This day/night effect is in stark contrast to what is observed at the Equator. This effect is caused by a combination of the Earth's axial tilt and its revolution around the sun. The direction and angle of axial tilt of the Earth remains fairly constant (on a yearly basis) in its plane of revolution around the sun. Hence during the summer, the North Pole is always facing the sun's rays but during the winter, it always faces away from the sun. The North Pole is significantly warmer than the South Pole because it lies at sea level in the middle of an ocean (which acts as a reservoir of heat), rather than at altitude in a continental land mass. Winter (January) temperatures at the North Pole can range from about −45ºF (−43°C) to −15°F (−26°C), perhaps averaging around −30ºF (−34°C). Summer temperatures (June, July and August) average around the freezing point (0°C, 32°F). 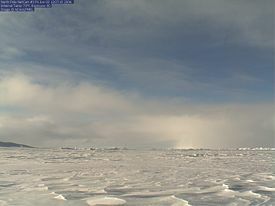 The sea ice at the North Pole is typically around two or three meters thick, though there is considerable variation and occasionally the movement of floes exposes clear water. Studies have suggested that the average ice thickness has decreased in recent years due to global warming, though this conclusion is disputed by some. Reports have also predicted that within a few decades the Arctic Ocean will be entirely free of ice in the summer months. This may have significant commercial implications. In most places on earth, local time is roughly synchronized to the position of the sun in the sky. Thus, at midday the sun is roughly at its highest. This method fails at the North Pole where each "day" lasts a whole year. There is no permanent human presence at the North Pole, and no particular time zone has been assigned. Polar expeditions may use any time zone that is convenient, such as GMT, or the time zone of the country they departed from. In 1925, based upon the Sector Principle, Canada became the first country to extend its boundaries northward to the North Pole, at least on paper, between 60°W and 141°W longitude. This claim is not universally recognized (there is in fact 478.46 miles (770 km) of ocean between the Pole and Canada's northernmost land point). In addition, Canada claims the water between its Arctic Islands as internal waters. Denmark (Greenland), Russia and Norway have made similar claims. The United States of America does not recognize Canada's, or any other countries' claims, and has passed nuclear submarines under the ice near Canadian islands without permission. “The ice-frozen North Pole is currently a no man's land supervised by a U.N. Commission. The five Polar countries—Russia, the U.S., Canada, Norway and Denmark—each control only a 200-mile economic zone along their coasts. And none of these economic zones reach the North Pole. Under the current U.N. Maritime convention, one country's zone can be extended only if it can prove that the continental shelf into which it wishes to expand is a natural extension of its own territory, by showing that it shares a similar geological structure.” On December 20, 2001, Russia made an official submission to the UN Commission on the Limits of the Continental Shelf in accordance with the United Nations Convention on the Law of the Sea (article 76, paragraph 8). 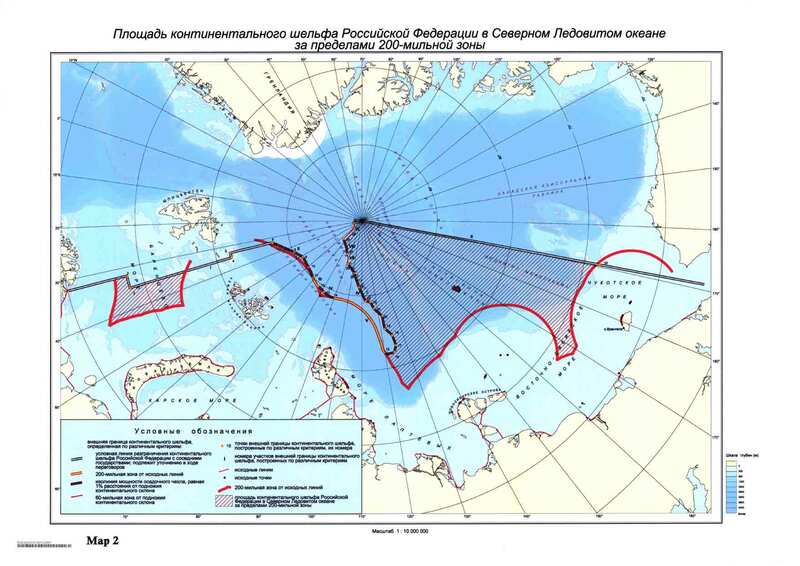 In the document it proposed to establish new outer limits of the continental shelf of Russia beyond the previous 200 mile zone, but within the Russian Arctic sector. The territory claimed by Russia in the submission is a large portion of the Arctic, including the North Pole. One of the arguments was a statement that the Lomonosov Ridge, an underwater mountain ridge underneath the Pole, and Mendeleev Ridge are extensions of the Eurasian continent. In 2002 the UN Commission neither rejected, nor accepted the Russian proposal, recommending that additional research should be carried out. In the summer of 2007, the Russians claimed a “great scientific discovery” that involved “more than 100 scientists on board the Akademik Fyodorov, Russia’s flagship research vessel, for what is the largest expedition yet organized to the Pole. A nuclear-powered ice-breaker, the Rossiya, accompanied the ship.” The expedition claims to have found that the Lomonosov ridge directly links Russia’s Arctic coast to the North Pole, and Russia insists that this guarantees their rights over much of the Polar territory, which contains some 10 billion tons of oil and natural gas deposits. Canada, the United States, Norway and Denmark (through its sovereignty over Greenland) are opposed to Russia’s claim to the North Pole. Canada and Denmark argue that the Lomonosov Ridge is connected to their territories. In May 2007, “U.S. Senator Richard Lugar told the Senate Foreign Relations Committee that Russia's claiming of the hydrocarbon-rich area would be to the detriment of U.S. interests.” The US has refused to ratify the Law of the Sea Treaty with governs disputes over exploitation rights because doing so would restrict its influence on the Arctic’s future. Russia’s claim to the Pole poses particular problems for the US. The potential value of the North Pole and the surrounding area resides not so much in shipping itself but in the possibility that lucrative petroleum and natural gas reserves exist below the sea floor. Such reserves are known to exist under the Beaufort Sea, and further exploration elsewhere in the Arctic might become more feasible if global warming opens up the Northwest Passage as a regular channel of international shipping and commerce. ↑ A Voyage of Importance, Time magazine, Aug. 18, 1958. Retrieved August 17, 2007. ↑ R. K. Headland, DIOI 4/3. onlineConcise Chronology of Approaches to the Poles. Retrieved August 17, 2007. ↑ International Snowmobile Hall of Fame, ISHOF, 2000. Retrieved August 17, 2007. ↑ Nauka i Zhizn, March 9, 2007.MIR will dive into the 5-kilometer deep (in Russian) Retrieved August 22, 2007. ↑ Science question of the week, Goddard Space Flight Center. Retrieved August 17, 2007. ↑ John L. Daly. website The Top of the World: Is the North Pole Turning to Water? Retrieved August 17, 2007. ↑ Jonathan Amos, BBC news story, December 12, 2006.Arctic sea ice 'faces rapid melt' Retrieved August 17, 2007. ↑ Global Warming Sparks a Scramble for Black Gold Under Retreating Ice, The Guardian, Rainforest Action Network, 2006 April 18. Retrieved August 17, 2007. ↑ David Adam, Global Warming Sparks a Scramble for Black Gold Under Retreating Ice, The Guardian, Rainforest Action Network, 2006 April 18. Retrieved August 17, 2007. ↑ Yuri Zarakhovich, Russia Claims the North Pole Time magazine, July 12, 2007. Retrieved August 17, 2007. ↑ 14.0 14.1 CLCS, Outer limits of the continental shelf beyond 200 nautical miles from the baselines: Submissions to the Commission: Submission by the Russian Federation United Nations. Retrieved August 17, 2007. ↑ UN map,  Area of the continental shelf of the Russian Federation in the Arctic Ocean beyond 200-nautical-mile zone] - borders of the 200 mile zone are marked in red, territory claimed by Russia is shaded. Retrieved August 17, 2007. ↑ Tony Halpin, Russia Stakes Its Claim on North Pole in Underwater Search for Oil The Times, online July 28, 2007. Retrieved August 17, 2007. ↑ Yuri Zarakhovich, Russia Claims the North Pole Time magazine news story, July 12, 2007 Retrieved August 17, 2007. ↑ Tony Halpin, Russia Stakes Its Claim on North Pole in Underwater Search for Oil. The Times, online July 28, 2007. Retrieved August 17, 2007. ↑ Tony Halpin, Russia Stakes Its Claim on North Pole in Underwater Search for Oil. The Times, July 28, 2007. Retrieved August 17, 2007. ↑ Yuri Zarakhovich, Russia Claims the North Pole Time magazine news story, July 12, 2007. Retrieved August 17, 2007. ↑ The Times, online July 28, 2007.Russia Stakes Its Claim on North Pole in Underwater Search for Oil Retrieved August 17, 2007. All links retrieved December 12, 2018. Polar Controversies Still Rage article by Roderick Eime. Goudarzi, Sara.Meltdown: Ice Cracks at North Pole, LiveScience, Sept 2006. This page was last modified on 12 December 2018, at 17:35.